Recognise it from the little preview of my recent purchases? That's right, I found it in a shop that was closing down when perusing the shops last week. I'm not sure if it is the exact same one, but it's certainly a strong enough reminder of the original for me to buy it. For £5, I figured there was little to lose, particularly as the original cost around £20. Loving the bright colours and it's actually quite versatile- so far I've worn it with a cardigan, with a t-shirt over it (as you can see above) and also with a simple v-neck black jumper over the top and a t-shirt underneath. The only, ever so slight, tiny weeny down side of the maxi dress is dirty feet. Because it's so close to the ground, it tends to drag across the top of my feet leaving me with horrendously dirty feet. I feel I may end up having to take a couple of centimetres of the bottom. But aside that, I'm loving this dress. Comfy- check. Versatile- check. Something a bit different- check. Suitable for the bipolar weather- check. I wore it on Saturday to travel South. When I left uni it was cloudy and practically gale force winds as well as being chilled but London was beautifully warm and sunny so this worked nicely for both without having to change on the way down or walk the streets of London feeling over hot. So what do you think? Too much colour and print? A dose of summer despite the reluctant weather? I like the fit and swirl of the dress. I am not sure about the patterns and colors. I think there is a bit too much going on, but I also think you toned it down well by keeping the rest of your outfit simple and clean. I love crazy patterns, the colours look amazing on you! Hey Chloe!! THanks for the lovely comment and showing me Ayden's blog. I love it! Hey Sweetie, I am loving this dress on you! That dress is lovely, and it looks great with the t-shirt layered on top of it. I really like this, I am such a big fan of maxis at the moment! Thank you for the chat yesterday it really cheered me up and I hope your exam went OK! 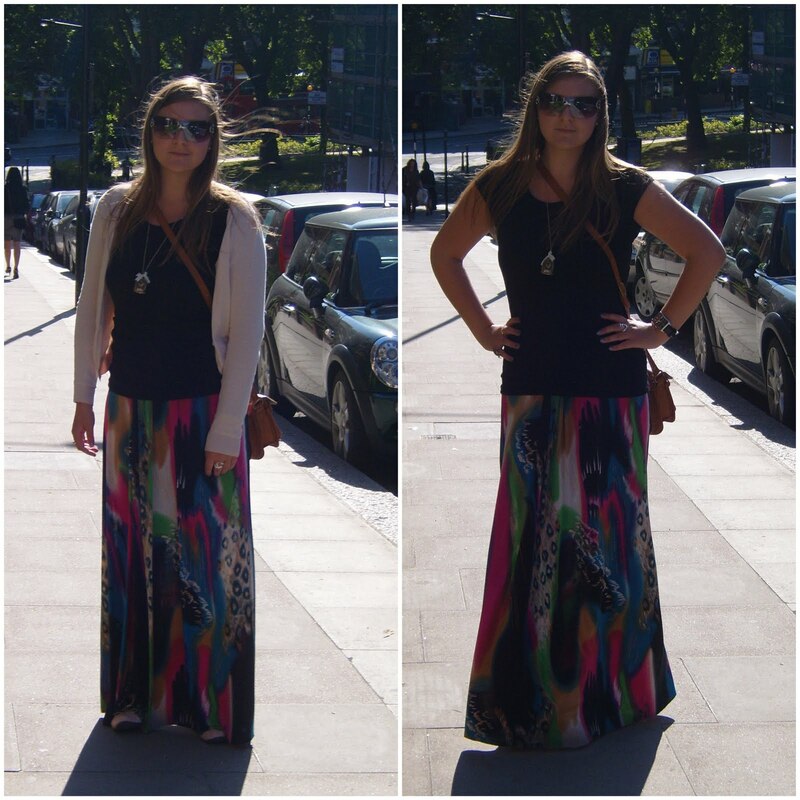 really love this maxi, so colourful and pretty, and love how youve mixed it up by layering it with a tee. This is such a beautiful maxi dress! The colours are amazing. I nervously bought my first maxi dress yesterday but I went with plain old black to ease myself in! Can't wait to wear it! And maybe some day I'll ease myself up to the rainbow brights!